Update, 02/24/09: Some good folks over at NPR (thank you, Andy Carvin and Bob Boilen!) are looking into the oversight written about here. They’ve since added proper credits to the piece. Also, Zoë is currently listed as the #2 seller on iTunes classical. All’s well that ends well. Koko Theater, October 2008, London. ⓒ Polstar Photography. I think my Coilhouse cohorts will agree that one of the very bestest things about being involved with this venture is being able to give props to lovable people who do lovely things. 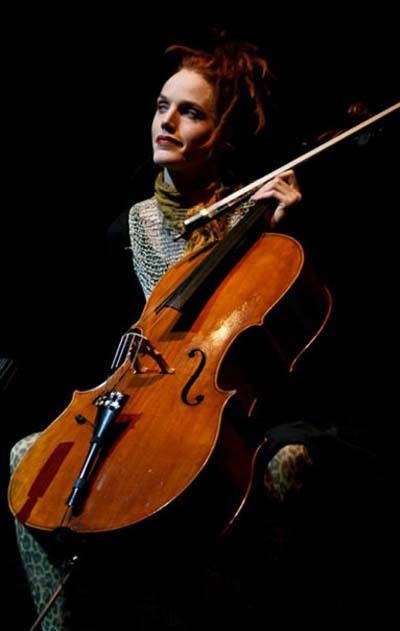 I’ve been meaning to sing the praises of cellist Zoë Keating for ages now. She’s a visionary artist with immense talent and soul… and a sweetheart to boot. When we first met several years ago, she was playing second fiddle (so to speak) in Melora Creager’s honorable neo-Victorian outfit, Rasputina. At the time, I was astonished by Zoë’s incredible ear and deep, rich tone. As it turns out, I was only hearing select facets of what she’s capable of. Zoë Keating opening for Amanda Palmer last year. Shot by AleXIXandra. More recently, Zoë has been self-producing and releasing solo recordings of a project she calls One Cello x 16, in which she deftly uses live electronic sampling, looping and repetition to create lush, beautiful layers of sound. Zoë is classically trained but a swashbuckler at heart; her music builds a hypnotic, swaying bridge between the old guard and the new. Ambient, pop, and orchestral sensibilities trade off, with each distinctive element bolstered by her powerful musicianship and sensitivity. Regretfully, the reason I’m finally getting around to writing about Zoë is a bit of frustration I’m feeling on her behalf. NPR’s show All Things Considered used a song of hers yesterday without permission or credit. Zoë’s been featured on NPR before –a great opportunity for her– but in my opinion, that’s no excuse for their programmers to assume she’d be fine with them arbitrarily yoinking her work and using it anonymously. NPR is supposed to support off-the-beaten-path artists, not exploit ’em, right? 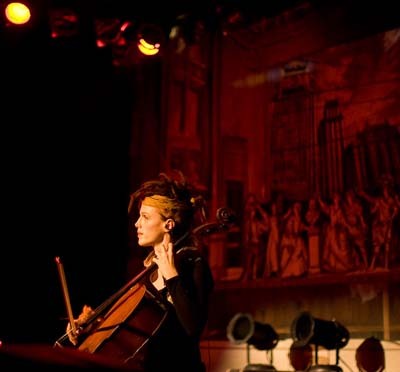 Photo by David Peterman during the “Who Killed Amanda Palmer” tour, 2008. People have written saying I should be flattered. Yeah, I’m flattered, but I have mixed feelings. I feel the same as [I did] when a Channel 4 doc used my music without permission, money or credit. I’m flattered… but also bummed that 1) my music isn’t worth anything and 2) no one thought to ask if I cared about how they edited it, or in what context it’s used. Also, the economics of it are kind of a bummer… I’m an obscure experimental musician. Just a link on the All Things Considered music page, along with all the other links to music used in yesterday’s show, would help. RadioLab is a good example of this. They use my music with my permission and they credit me. I am happy for them to do this because I love and support what they do, and I benefit from increased exposure and substantial iTunes sales (thank you RadioLab!). That is a fair exchange… (although sometimes I think I should pay a cut to RadioLab because they have helped me so much). Sometimes this business is such uphill going that I have to remind myself why I spend all my time doing it (er, why? something about the need to create, blah blah). Maybe it would be easier to go back to being an Information Architect and just [doing] a little music in the evenings for my own benefit. Ha! Not likely. I’m hoping this post will send at least few new pairs of ears Zoë’s way. Maybe some of you seasoned fans will spread the word as well? You can buy Zoë Keating’s gorgeous music on iTunes, eMusic, Amazon, or directly through her site. Support this woman. She deserves all the credit in the world. But she’s still on my must-see-before-I-die list. Before that, though, I’ll content myself by getting this out there, so much as I’m able. There’s no sense in we artists being forced into hobbying that which drives us. Much as I dig NPR, they need to address this slight. As one who has also had his work used with neither permission nor compensation (seems all too common with photographers for some reason), I can fully sympathize. Then again, I can fully sympathize simply as a decent human being. Zoë is an amazing artist who clearly works very hard at her craft, and to have her art stolen like that shows an appalling lack of respect. And it’s all the more galling when it’s a person or organization you’d think would be more sympathetic to the plight of the obscure artist. For shame, NPR. And now, the positive side of my reply: this post reminded me that I’ve been meaning to pick up some of her stuff for the longest ever, and so I’ve done just that. So yay and thank you for that, Mer! I do believe her beautiful musics are exactly what I needed right at this very moment. Funny how that works. I LOVE Zoe! Every time I have interacted with her she has been a gracious star as well as a total joy. I am supporting her by purchasing as much of her music as I can afford, and will always try to catch her in concert in Seattle! I don’t know whether I’d use the term “stolen” to describe the appropriation of art – especially art in a freely copiable digital format. Once it’s out there, it’s out there… a gift from the artist to the people. Still, having it pay back is vitally important to any artist who doesn’t want to spend her practice time on the assembly line. As a musician, I’m totally sympathetic to Zoe’s plight of the underground artist. I’d probably involve myself in occult rituals involving adorable drowned animals in order to secure a shout-out to a seven-digit audience. I hope that this issue provides NPR with the fuel they need to ensure that shout-out in every show – even if it’s a two- or three-degree connection of “List of musicians in this episode provided at NPR.COM” or whatever. I sympathize entirely with Zoë Keating; it is particularly unprofessional for an established organization like NPR to use material like this without verifying permissions and attributions. Has anyone contacted All Things Considered about this? Have they offered any comment on why they failed to seek permission and/or attribute the music to the source? Thank you, and good luck, Zoë! i was living in boston whilst zoe was still a part of Rasputina and i had the wonderful opportunity to see her live numerous times, and amazing of course! as for npr, i don’t think they’re as amazing as everyone touts them to be. maybe they used to be in the past, but they’ve fallen through the cracks. whether it was every day reporting between the campaigns of hilary vs obama, republican vs democratic, or on issues of subculture or minorities, it was poor and narrow minded. has anyone contacted npr for their botch? It may be that the proper person for redress is Suzi Parker who did the story. You’ll note that the music in question was not a bumper (the music used in between stories), but was actually in the edited piece. As the (independent) producer of the package, she should have gotten clearance. I’m incredibly disappointed in NPR. I would have expected better than something like this from them. I hadn’t heard anything by Keating since she left Rasputina. Which I think is a shame after the clip embedded in the post. Loved it, and I had to order a CD. While I didn’t hear the specific NPR broadcast, NPR has a tendancy to use short clips of all sorts of music. NPR is a non-profit organization. Short clips of recordings used for purposes of not making money is nearly the definition of “fair use”. I am assuming that Zoe’s music was used in the way music tends to be on NPR, of course, which perhaps it was not? Was other music used similarly credited but Zoe’s was not? Or is there something that you think distinguishes Zoe’s music that it should be treated differently? Or do you think that it is fair use but still rude? I wonder if this is quite the conscious decision it is presented to be. Radio producers are not, I think, negotiating individual rights for broadcasting music: these rights (and payment for them) are being managed automatically through ASCAP, BMI etc. Some copyrights associated with music are mechanical and compulsory (I’m not sure how it goes with broadcasting recordings). I suspect that rights that can’t be negotiated through these conventional channels may fall through the cracks more often than not, not because the producers decide they might as well just use something for free but because it just isn’t part of their ordinary procedures. She should by all means be contacting the producers and discussing the situation with them if she has not already. To clarify, I appreciate the hell out of NPR and listen to it just about every day…but I DO think it’s important to call them on this. Lonelocust, I’d say this situation is quite close to fair use, but still very dismissive and frustrating. And this is something that happens to hungry, relatively obscure artists (musicians and photographers in particular) all the time. It always stings. You’ll notice Zoë’ isn’t asking for money, right? Just a link, or an acknowledgment? No, no. It’s always really frustrating to see an artist’s work used without credit or permission, regardless of context. Hell, it’s a mistake I’ve made as a journalist more than a few times. If it’s in print, you run a retraction/addendum the next issue. Nowadays, online, it’s even easier to make amends: if I can’t find a byline for an image, I’ll tend to say “if this is your image, let us know, we’ll immediately credit you.” NPR should be able to fix their oversight quite easily. I was in a stunned daze for her whole set. Her CD is amazing. Thanks for posting that song, too, since it’s not on the album. I don’t know anyone who hasn’t been impressed when they hear her stuff. Ugh — I heard that story the other day, hated it. That being said, what lonelocust said. Wil picked up this story, then Neil Gaiman twittered about it, now people are politely requesting that Zoë be credited in comments on the news story over at NPR, and hopefully she’s selling a ton of music as a result. Not too shabby for a series of tubes. High fives, duckies! Zoe is awesome. I also had the honor of hearing her magical strings vibrate at an Amanda Palmer show not too long ago. Sounds hot, right? It was much hotter than that. It was the kind of music where you could close your eyes and start that serene slow-motion run through the mystic forest at any given moment–even relatively sober. I would pay to see her headline. @ Mer: BEHOALD, TEH POWAR OV TEH INTARWUBZ!!! That reminds me of Matt Howden’s work as Sieben. This is fair use, plain and simple. All the music you hear as interstitial songs on NPR or in the background of whatever MTV or VH1 reality show you’re channel surfing across are used under fair use. This American Life has used music I love for the same purposes described above for years, and I’m always struck by the conscious choices the producers (and most likely interns) make in choosing their tracks. I’ve always felt there should be a music credit at the end of the show, or at least a specific website to offer up during the credits with a list of music used during that episode. I should also say that I love Zoe Keating’s music (I saw her with Rasputina in an awful bar in Columbia, SC a few summers ago and have followed her ever since), and it’s unfortunate that these producers see fit to use her music to set a certain tone yet not credit her as the artist–but it’s how it’s been done for ages. For that to change, there needs to be a systemic change regarding giving credit to the artists, similar to the attribution license under creative commons. This is good. This was probably just a boneheaded mistake to begin with…but I’d bet NPR battens down the hatches and puts in a new policy safeguard or something to prevent this from happening again in the future. What’s NPR without its good reputation? Zoë Keating is magic on the cello for sure. I think we need to separate the “permission” and “credit”. Radio stations pay fees to the performers rights and publishing organizations for music that’s on CD and money flows (dribbles?) back to the performer. It would be completely impractical for a radio station to seek permission every time it played a piece of music. Credit is a separate issue. I guess this boils down to appropriateness to the format of the program, respect, and as others have said, politeness. Perhaps NPR credited the music on a website? It’s my understanding that NPR pays fees to the recording rights organizations for using music, and that money flows or trickles back to the musician based on usage. It’s completely impractical and unnecessary for a radio station to seek permission every time it uses music that’s been published and recorded. Giving credit is separate matter. That boils down to courtesy, format, practicality, and whether the artist seeks on-air credit or online credit. Best purchase I made yet. The way she plays makes me wish I had stuck with music instead of going into computers. Looks like they have now added Zoe’s name on the webpage where the story appears, on NPR.org. Glad to hear that NPR added credit. Better late than never. I don’t like to hear the “you should be flattered” argument. Artists hear it all the time. I don’t like the way it presupposes that producers of original content should be grateful to give their work away, whereas the gatekeepers have the right to choose what to present and how and what it’s worth. Content producers-creatives, photographers, musicians, etc.-also have the right to decide what their work is worth to them and how and where to give it away. Radio stations pay a blanket licensing fee to music publishers to use music, including full songs, as bed music or “bumpers” in between segments, as you often hear on NPR. Fair use does not apply, the ASCAP/BMI agreement does. It’s sort of sad that in the fight/current-climate between file sharing companies, file sharing users and professional rights organizations that the idea of copyright for independent artists has becoming as meaningless as confederate script. I just talked with Bob Boilen, former director of All Things Considered and host of All Songs Considered. When he was director of ATC, he was in charge of selecting music, so he knows a lot about how this works. Essentially, there are two issues here: permissions and crediting. Permissions is fairly straightforward. NPR pays fees to major music licensing orgs like ASCAP, of which many musicians are members. That allows us to use snippets of music on air without having to negotiate permission on a case-by-case basis. Meanwhile, many artists also submit their music to NPR in the hopes of having it played on air. But since Zoe’s music is ASCAP registered, permissions would have been covered under that relationship, since we pay ASCAP fees as well. So if the system works properly, Zoe gets paid by ASCAP when we air her work and log it properly. The other issue, though, is NPR giving Zoe credit. Zoe notes correctly that entities using ASCAP are supposed to log their music plays. NPR has an in-house system for doing this, so we can track all of the music we use, report on that use, and give credit to the artist publicly. If you look at the rundown the day the story in question aired, the song that follows the story is by the band Tuatara. The rundown page credits that band, and when you listen to the audio for the story, that’s the music you hear. So at least on our website, which captures the stories and music interludes we broadcast, there’s no sign of Zoe’s music that I can find so far. I thought this was strange, so Bob and I searched our internal database for Zoe’s music, since that would tell us if she’d ever been considered or actually used by one of our shows. Two shows listed her music – Morning Edition and Day to Day. I can’t tell if this means they actually used her music at one point, or if they merely flagged it as of potential interest. Either way, nothing turned up for All Things Considered. I asked Bob why this might be the case, and he came up with two theories. One is that NPR itself didn’t use her music in the broadcast, but a local station used a piece of hers as interstitial music – and that’s what Zoe ended up hearing. Stations often will layer their own local content, including music interludes, over our national programming, so it’s possible that Zoe happened to hear a local station do this. Bob’s other theory was that it was possible that one of the hourly feeds of All Things Considered switched the music around for some reason, and it didn’t get logged properly. ATC is re-aired each hour so stations around the country can choose when they want to begin airing it, and sometimes edits are made to subsequent feeds. In theory, though, this should at least be flagged when we do a search for Zoe’s music in our database, but it’s possible that something fell through the cracks. So at this point, I’m close to reaching a dead end, but not entirely. I plan to ask the director of the show that day to see if he knows Zoe’s music. If he says yes, it probably means something went wrong with the logging of a feed. If he says no, it probably means it was a local station using her music and not NPR itself. It would also help if Zoe could reconfirm that this was indeed the story she heard, and if she could say what time of day she heard the story, and at what point in the story she heard her music. Either way, I’m gonna keep poking around. Hey, Andy, thanks for those clarifications. Will write an addendum for this piece right away. I’m confused… Zoe’s music was used –cut and spliced– into the MIDDLE of the piece on the two girls who fell asleep on the train tracks. Does that qualify as interlude, interstitial, or bumper music? She’s in Australia right now in the middle of some pretty intensive gigs, which is probably why you haven’t heard from her… I’ll pass a message onto her for you and Bob. Thanks for doing what you do, and for addressing this! Beautiful music and I must say – great style, too. so .. why are y’all bitching again? Rob, darling, you’re a bit late to the party.